Former Minister Keheliya Rambukwella said the car driven by his son Ramith Rambukwella, arrested on charges of drunk driving yesterday morning, had a hit a tree. “There was a bachelor’s party. He was returning from it. 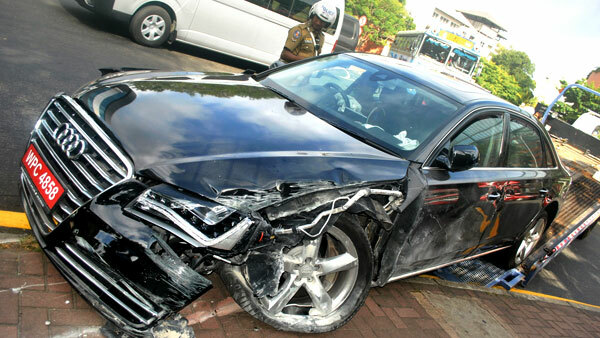 On his way, his vehicle hit a tree at Independence Avenue,” the former minister said. “There was no damage to anything, no damage to a third-party, or to public property – his vehicle just hit a tree,” he said. Ramith Rambukwella was released on Police bail yesterday. This is not the first time the son of the former Media and Information Minister has been in trouble for drinking too much. In June 2013, the then 21-year-old national cricketer tried to open the cabin door on a British Airways flight from St.Lucia to London Gatwick. It was alleged he was inebriated at the time. Rambukwella said he mistook the cabin door for the lavatory, and implied the mistake happened, because he was half asleep. He was made to forfeit 50% of his tour fee and was issued a severe warning from Sri Lanka Cricket.